Need soffit installation in Sherwood Park, AB? Make sure you’re working with the right people! At Nomad Roofing, we draw on more than 10 years of experience to take care of soffit and fascia needs for homes in Sherwood Park and the surrounding communities of Edmonton, Spruce Grove, Stony Plain, St. Albert, Morinville, Beaumont, Leduc, and Ardrossan. We understand how important soffits and fascia are so we guarantee that only quality products and superior craftsmanship go into each job. Soffits and fascia are installed as slats beneath your roof’s lip, preventing debris swept in by the wind from settling in. Because they are critical to your home’s curb appeal and function, soffits and fascia have to be installed properly and professionally. Damage or missing, they not only expose your home to costly repairs in the future but can damage your home’s value as well. At Nomad Roofing, we don’t want any of that so we provide you with expert services to guarantee your soffits and fascia are installed right. Properly installed, these components of your roofing system can then do their job perfectly, ensuring your home’s form and function are not compromised. 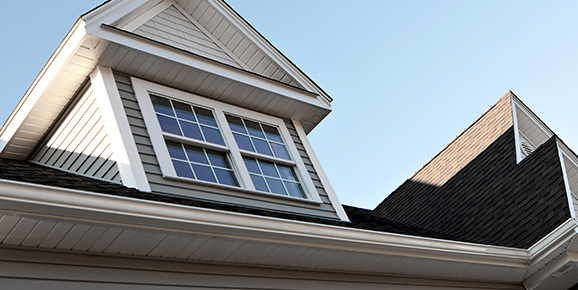 All soffit and fascia installations also come with our industry-leading warranties to give you absolute peace of mind. Nomad Roofing is guided by a desire to raise professionalism in the industry, committing to putting customers’ needs first to guarantee their satisfaction. We have been in business since 2006 and have dedicated ourselves to improving our craft to ensure all customer needs are addressed perfectly. Aside from soffits and fascia, we also offer roof repair and replacement, roof maintenance, new construction, solar installations, skylights, and sun tunnels. Some of the brands we carry include: GAF, CRC, Iko, GEM Euroshield, Certainteed, Malarkey, BP, and Velux. To learn more about our soffits and fascia services, call Nomad Roofing today at (780) 686-8386. We also have an online request form you can fill out to receive a FREE estimate.